It’s our night to recognize the season-long achievements of our junior jumpers!Snow in April? What a fitting backdrop for this year’s Junior Banquet. While the roads iced over, the 2018 winter season melted into the memory books. Over 90 people attended this year’s banquet. 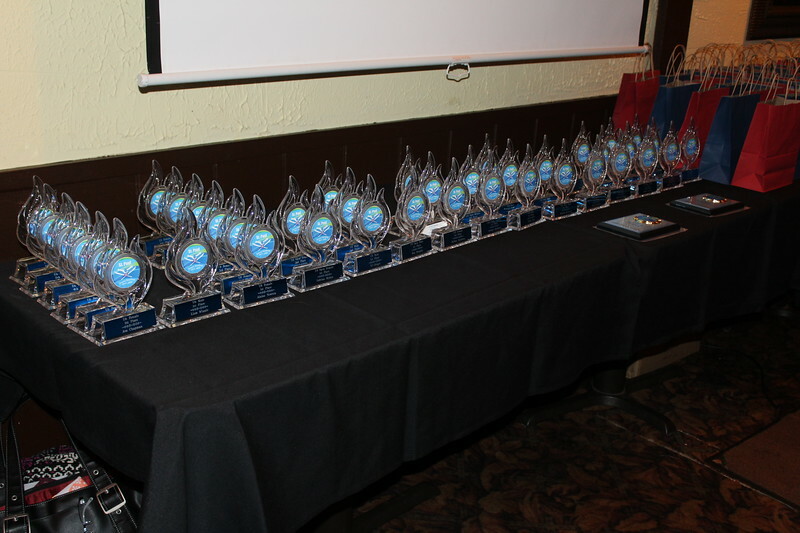 It was a night to recognize achievement and say a heartfelt “thanks” to everyone who made this season a success. As usual, the awards presentation was the highlight of the evening. One by one, the smiling faces of our junior jumpers received their age class trophies from the coaches. Each skier also received a new, St. Paul Ski Club printed buff and a club cowbell. So many of our young jumpers made huge improvements under the care and instruction of our dedicated coaching staff. In recognition of their commitment, the coaches were given gifts as well. Head Coach Brian Wallace, and Assistant Coach Mary Lu Kavanagh-Beltman were given personalized photo blankets. Assistant Coach Joe Berens, who also judges and competes at our Friday night tournaments, was given a plate decorated with photos that commemorate his special role in our club.The evening concluded with the traditional singing of the ski jump song and a group photo. Snow is still in the forecast well into April. Hard to believe we are left to hoping it melts in time for summer jumping on plastic.